The development of efficient and accurate strategies for evaluating and predicting the root yield of cassava (Manihot esculenta Crantz) can reduce the effort and time spent on phenotyping complex traits associated with productivity and abiotic stress. 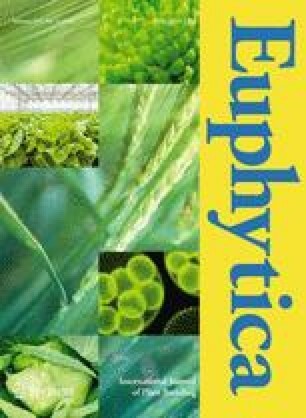 The objective of this study was to select phenotypic traits that are highly associated with fresh root yield (FRY) as well as to establish a prediction model of the performance of genotypes under water deficit conditions. A total of 49 cassava genotypes were evaluated in a complete randomized block design, with three replications and two water conditions: well-watered (control-WW) and water deficit. The physiological and agronomic traits were divided into three groups: Phys (all physiological traits); Phys + ShY (all physiological traits, with addition of shoot yield) and Phys + Agro (all physiological and agronomic traits). They were evaluated using six different predictive models: classification and regression trees, artificial neural network, support vector machines, extreme learning machine (ELM), generalized linear model with stepwise feature selection (GLMSS) and partial least squares (PLS). These same groups, but reduced to only the most important predictive traits, were also analyzed. The most important traits for predicting FRY were number of roots per plant, leaf area index, number of leaves measured in the eighth month, and shoot yield. The selection of the most important traits resulted in the best adjustment of the models, with GLMSS, ELM, and PLS being the models that presented the highest reliability of prediction according to the values of r2 > 0.75 with RMSE ranging from 0.49 to 0.51. The online version of this article ( https://doi.org/10.1007/s10681-019-2399-0) contains supplementary material, which is available to authorized users. The authors thank the Fundação de Amparo à Pesquisa do Estado da Bahia (FAPESB), Coordenação de Aperfeiçoamento de Pessoal de Nível Superior (CAPES) and Conselho Nacional de Desenvolvimento Científico e Tecnológico (CNPq) for the financial assistance and scholarship support.